The Nespresso VertuoPlus is a new capsule coffee machine that debuts a feature called Centrifusion Extraction Technology alongside several other interesting features. Here’s our Nespresso VertuoPlus review. Nespresso VertuoPlus review: What’s new? There are three features that set the VertuoPlus apart from traditional Nespresso machines. 1. Centrifusion extraction technology: This is a new brewing technique developed by Nespresso. It spings the capsule at up to 7,000rpm (centrifugal) while brewing with hot water (fusion). 2. Barcode technology: VertuoLine (its developers) combines the Centrifusion this with barcode technology that’s printed on the rim of individual coffee capsules. The barcode lets the Nespresso VertuoPlus machine identify the inserted capsule so it can brew the coffee accordingly (using the Centrifusion extraction technology). 3. Rotating water tank: The third new feature has nothing to do with the brewing process. It’s rotating 1.7L water tank simply lets you chose which side you want your water reservoir to sit. It’s still a welcomed addition. The coffee: This is one of the more versatile Nespresso capsule coffee machines. It makes four different types of coffee. These are a 414ml full-brew Alto; 230ml Mug, 150ml Gran Lungo and 40ml Espresso. Unlike other Nespresso machines, where you insert a capsule and then select the size of drink you’d like, this machine uses individual capsules to dictate the size of drink it brews. Sadly, this machine will not accept Nespresso capsule from other Nespresso devices either. The VertuoPlus has its own capsule size and shape. We’re told this is to facilitate the new barcode design. How much of a difference do the Centrifusion extraction and barcode technology make? The biggest compliment we can give it is saying that it’s no worse than coffee brewed with traditional techniques. Where the VertuoPlus excels is with its crema. No matter what size coffee it brews, you’ll find a good portion of crema on top. This protects the coffee aroma locks the flavour in the cup. See also: Nespresso Krups Prodigioo review. Ease of use: The biggest change you’ll notice here is the automatic loading and machine piercing of the coffee capsule. 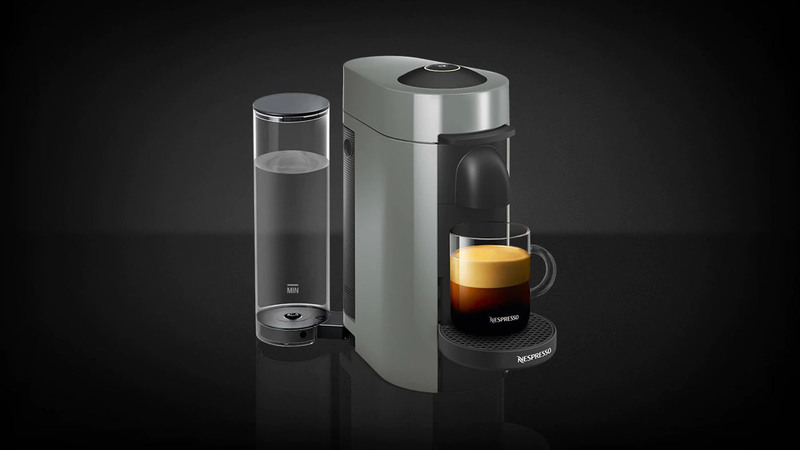 Insert your pod into your Nespresso VertuoPlus, touch a button and the machine does the rest. Cold water heats up in approximately 40 seconds and takes a further 10-20 seconds to brew your coffee. Not quite what you’re looking for? Read our Krups Nespresso Expert Coffee & Milk Machine next.